In Christian apocryphal gospels Uriel plays a role, differing between sources, in the rescue of Jesus’ cousin John the Baptist from the Massacre of the Innocents ordered by King Herod. He carries John and his mother Saint Elizabeth to join the Holy Family after their Flight into Egypt. Their reunion is depicted in Leonardo da Vinci’s Virgin of the Rocks. Uriel is often identified as a cherub and angel of repentance. He “stands at the Gate of Eden with a fiery sword”, or as the angel who “watches over thunder and terror”. In the Apocalypse of Peter he appears as the Angel of Repentance, who is graphically represented as being as pitiless as any demon. In the Life of Adam and Eve, Uriel is regarded as the spirit (i.e., one of the cherubs) of the third chapter of Genesis. He is also identified as one of the angels who helped bury Adam and Abel in Paradise. Stemming from medieval Jewish mystical traditions, Uriel has also become the Angel of Sunday (Jewish Encyclopedia), the Angel of Poetry, and one of the Holy Sephiroth. Uriel is depicted as the destroyer of the hosts of Sennacherib. He checked the doors of Egypt for lamb’s blood during the plague. He also holds the key to the Pit during the End Times and led Abraham to the West. In modern angelology, Uriel is identified variously as a seraph, cherub, regent of the sun, flame of God, angel of the Divine Presence, presider over Tartarus (hell), archangel of salvation, and, in later scriptures, identified with Phanuel “face of God”. He is often depicted carrying a book or a papyrus scroll representing wisdom. Uriel is a patron of the Arts. 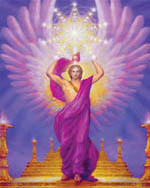 In the Eastern Orthodox Church, Uriel is commemorated together with the other archangels and angels with a feast day of the “Synaxis of the Archangel Michael and the Other Bodiless Powers” on November 8 of the liturgical calendar (for those churches which follow the Julian Calendar, November 8 falls on November 21 of the modern Gregorian Calendar). In addition, every Monday throughout the year is dedicated to the angels. In Thomas Heywood’s Hierarchy of Blessed Angels (1635), Uriel is described as an Angel of the Earth. Heywood’s list is actually of the Angels of the Four Winds: Uriel (south), Michael (east), Raphael (west) (serving also a governor of the south, with Uriel), and Gabriel (north). He is also listed as an Angel of the four winds in the medieval Jewish Book of the Angel Raziel, which lists him as Usiel (Uzziel); according to it, this book was inscribed on a sapphire stone and handed down from Seraph to Metatron and then to Adam. At the Council of Rome of 745, Pope St. Zachary, intending to clarify the Church’s teaching on the subject of angels and curb a tendency toward angel worship, condemned obsession with angelic intervention and angelolatry, but reaffirmed the approval of the practice of the reverence of angels. This synod struck many angels’ names from the list of those eligible for veneration in the Church of Rome, including Uriel. Only the reverence of the archangels mentioned in the recognized Catholic canon of scriptures, Michael, Gabriel and Raphael, remained licit. In the first half of the 11th century Bulgarian followers of the dualist heresy called Bogomilism who lived in the dukedom of Ahtum in present day Banat invoked Uriel in rituals. This is witnessed by Gerard Sagredo, Catholic bishop of the area after 1028. In Henry Wadsworth Longfellow’s translation of The Golden Legend, Uriel is one of the angels of the seven planets. Uriel is the angel of Mars. Thank you so much for these inspiring words from Uriel, my favorite angel. :-). We are all so blessed by the messages each week!! !